Weekly poll: what’s the ideal screen size? Smartphone screens have been growing for years now, but recently they started growing in only one dimension  height. This led to taller and taller aspect ratios that redefined how large a 6 screen is. Heres a comparison: a 6 18:9 screen is essentially a 5.5 16:9 screen with an extra row on top (1.5cm or half an inch taller). This is largely because wide phones are uncomfortable to hold. But tall phones are not easy to use either, reaching elements on the top of the screen gets trickier with every added inch. A well-designed user interface can alleviate this to some extent by keeping the important stuff near the bottom where its easy to reach. Still, theres a limit to how tall you can go. If rumors are to be believed, Sony is about to test those limits with a 21:9 screen on the Xperia XZ4. A 6.5 screen in a 166.9mm body  one of the tallest phones ever. Good thing that theres a 5 XZ4 Compact in the works too. Its not just Sony either, the new notch trend gave everyone an excuse to stretch the screen a bit more. Theres a whole bunch of different aspect ratios right now, which makes comparisons a little tricky. 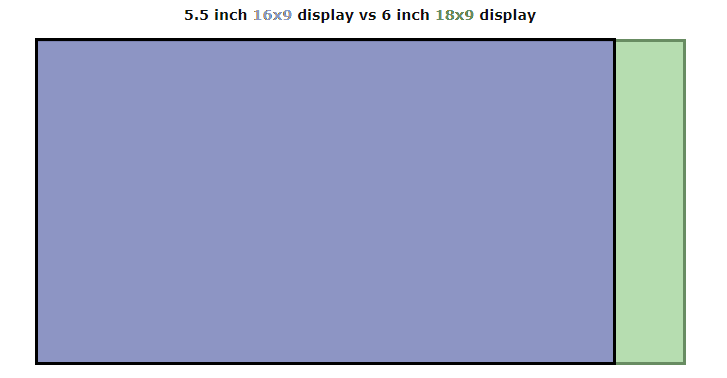 But assume an 18:9 aspect ratio or 18.5:9 as these tend to be the most common. Whats the perfect screen size?